Several cameras have been strategically positioned around the spacecraft and programmed to take a picture every 3 seconds. Inside the cleanroom, utter silence pervades, which is interrupted only by the regular clicking of the cameras. Three windows provide a view of the cleanroom from the rooms outside. Behind those windows, the rooms teem with people. All eyes are glued to the spacecraft. The anticipation in the air is sliced by the sudden ringing of a red telephone on the wall. We’ve been expecting the call: the software team is ready to command the deployment sequence. There is only time for one last quick check: are we good to go? The team leader confirms that we are go for deployment and hangs up the phone. Shortly after, there are 12 loud bangs at regular intervals of 3 seconds, followed by 12 softer clicks, and the frames open slowly. The sunshield starts to deploy, exactly as planned. The sunshield is vital to maintain the thermal stability of the telescope and it helps to keep the low temperature required by the detection electronics. Without it, as the spacecraft spins slowly around its axis to observe the stars, each point on the external surface would be alternately heating up when it faces the Sun and cooling down as it goes into the shadow. This would generate thermal distortions in the telescope that, although tiny, would be enough to ruin the extreme accuracy required to fulfil the scientific objectives of Gaia. 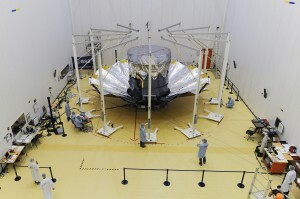 After assembling the sunshield on the spacecraft in Kourou, the deployment test serves as the final check to verify that the sunshield is correctly mounted and ready to work in outer space. Each of the 12 frames that make up the structural skeleton of the sunshield is hinged at its base. For launch, the frames are kept stowed so that they stay vertical around the cylindrical body of the spacecraft. Each frame is bolted at mid height to the spacecraft. This stowed configuration is necessary to fit the spacecraft inside the fairing, which will protect the Gaia spacecraft during the ascent phase as the launcher rocket races up through the atmosphere. Three and a half minutes after lift-off the launcher will already be at an altitude of 115 km above sea level, where the atmosphere is so thin that the protection from the fairing will be no longer needed. At that stage, the fairing is jettisoned. An hour after launch, at the beginning of its one-month journey to its vantage point one and a half million kilometres from Earth, the sunshield of Gaia will be deployed. In order to deploy the sunshield, the bolt that attaches each frame to the spacecraft is screwed into the thread of a pyrotechnic nut. The thread is split radially in three parts held together. An electrical signal is sent to fire a tiny explosive charge inside the small, closed chamber on each pyrotechnic nut. The pressure build-up from the explosion activates a mechanism that opens the split thread, thereby releasing the bolt and the corresponding frame. The complete device is not much larger than an espresso coffee cup. Each explosive charge is made up of 114 milligrams (0.114 grams) of zirconium potassium perchlorate powder (ZPP). The amount of energy released by each charge is similar to that of a bullet as it is expelled from the barrel of a hand pistol. Each pyrotechnic nut has 2 of these explosive charges, a main and a redundant one. First, all main charges are fired to open the nuts, resulting in the first 12 bangs. Thereafter, all the redundant ones are also fired – the 12 subsequent clicks – as a precaution in the case that any of the main charges had failed to go off. Once all 12 frames are released, springs in the hinges push the frames open. Two of the frames are equipped with electrical motors that can provide additional torque if required, and ensure a constant, controlled deployment speed so as to bring the sunshield smoothly into its final deployed position. Opening the sunshield here on Earth presents one difficulty that we will not face in outer space: the force of gravity. As the springs and electrical motors rotate the frames to open them, the weight of the sunshield will generate an increasing torque on the hinges. Although the sunshield is very lightweight for its size, its own weight would be enough to damage the structure, because it is designed to operate in the zero-gravity environment in outer space. Therefore, the deployment on the ground requires a gravity compensation system. This system involves hanging each frame from a cable guided through pulleys along metallic beams to a system of counterweights placed around the spacecraft. The sunshield deployment test has worked flawlessly. Now, after the final flatness checks and a detailed inspection, the sunshield must be re-installed to be ready for launch. This will require removing the deployable triangular blankets that cover the space in between the frames, bringing the frames back into their stowed position, installing new pyrotechnic nuts, rolling up the deployable blankets and re-mounting them. The Gaia sunshield is unique. Few spacecraft have such a light deployable structure of this size. Its development has been rife with difficulties, its testing has presented many challenges, but the efforts of SENER, RUAG, ASTRIUM and ESA over the last decade, from its initial conception until this moment, have paid off. The sunshield is now ready to fly. The next time it deploys will be in outer space. In the meantime, the preparations for the launch of the Gaia spacecraft continue here in Kourou. By Daniel Escolar, Gaia Mechanical Engineer, reporting from Kourou.